Henry Holt and Co., 9780805077315, 304pp. On October 23, 1998, the Buffalo abortion provider Barnett Slepian was killed by a sniper's bullet fired through the kitchen window of his home. Days later, police informed another local doctor, Shalom Press, that they had received a threat warning that he was "next on the list." Within hours the Press household was under twenty-four-hour federal marshal protection. America's violent struggle over abortion - which had already claimed the lives of five doctors and clinic workers - had come to Buffalo. 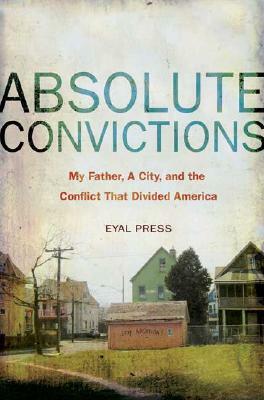 In Absolute Convictions, Eyal Press returns to his hometown seeking to understand how an issue many people thought was settled decades ago could inspire such rage. Press combines a retelling of his family's experience with firsthand accounts of protesters arrested outside his father's office, patients who braved the gauntlet of demonstrators, and politicians who attempted to appease both sides. Through the Press family and the city of Buffalo, a blue-collar town undergoing wrenching economic changes, we see, as never before, the people behind the absolute convictions that have divided our nation for the past three decades. With remarkable sensitivity, Press has written both a gripping narrative account of a family and a city caught in the crossfire of moral fervor and individual rights, and an incisive history that offers new insight into the economic and social roots of America's most volatile conflict. "The Nation" and "The American Prospect," his articles have appeared in "The Atlantic Monthly," "The New York Times Magazine," the "Los Angeles Times," and "Mother Jones." He was a finalist for the 2004 J. Anthony Lukas Work-in-Progress Award and has received the James Aronson Award for Social Justice Journalism, the Science-in-Society Award from the National Association of Science Writers and Editors, and an Open Society Institute fellowship. "Absolute Convictions is more than a family history or a personal reflection on how a movement framed around the right to life can lead to murder. It's all that and more. While conveying respect for the depth of the convictions held by the pro-life movement without endorsing their methods or goals, Eyal Press has put a face on one of the most divisive issues of our day, offering a thoughtful analysis of the social and economic forces shaping our country, and particularly the city of Buffalo, from the earliest days of the pro-life movement until today." "Eyal Press has achieved a very difficult balance. He records his father's and his hometown's place in the searing debate over abortion with passion and, at the same time, a remarkable even-handedness. The action in his story is gripping, at times violent, and almost always personal, but he tells the story with analytical rigor and moral insight, which make his memoir important history." "Eyal Press has written a superb account of America's abortion battles by focusing on one family caught in the vortex-his own. While eloquently capturing the quiet courage of his father's efforts to keep providing services in a climate of mounting violence, Press gives all parties a sensitive hearing. In the process, he offers striking insights into the roots of America's culture wars, recounted in an absorbing narrative whose pace never flags." "Absolute Convictions provides a remarkable new view on a familiar and embattled topic. Eyal Press's description of the drama that engulfed his family and town is both vivid and compassionate, and it helps explain what it would take to resolve America's abortion wars." "Eyal Press's Absolute Convictions is an invaluable contribution to understanding the vast and persistent divide over abortion. Reporting from the ground-up, Press incisively and compellingly examines why and how the anti-abortion movement turned towards violence - and why and how in the face of that violence individuals like his father have stood firm for what they believe."